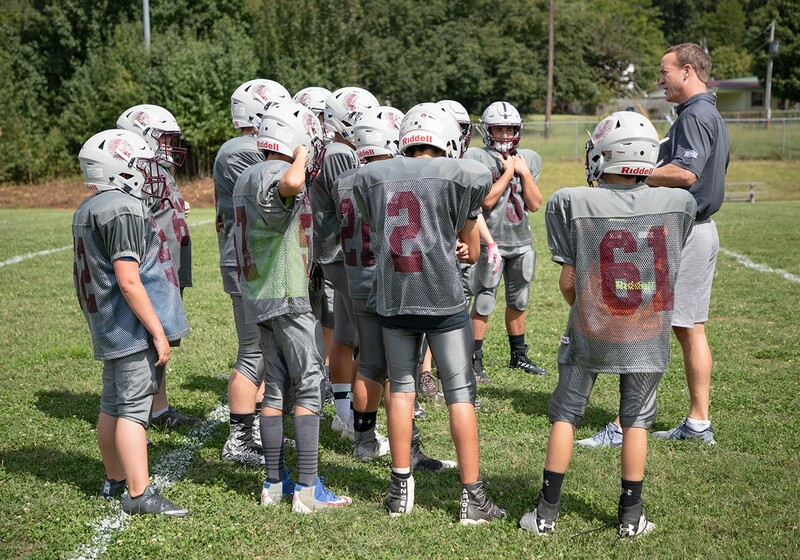 When it comes to youth football, the most important concern for coaches and parents is making sure the kids are taught the proper techniques of the game and the equipment they’re using is safe. With the media attention on injuries in football, steps are being taken to ensure that the game is played the right way and the safe way. One of the schools that submitted a winning entry for an equipment bid was Rogersville Middle School in Rogersville, Tennessee. Head Coach Jeremy Bailey and his staff have been stressing aspects of Smarter Football and Heads Up Football. So with a need for better equipment, Bailey decided to throw the school’s hat into the ring. But he didn’t tell anyone about it. Not his players. Not his coaches. Not his family. So imagine Bailey’s surprise when he found out that he was one of the 18 winners! 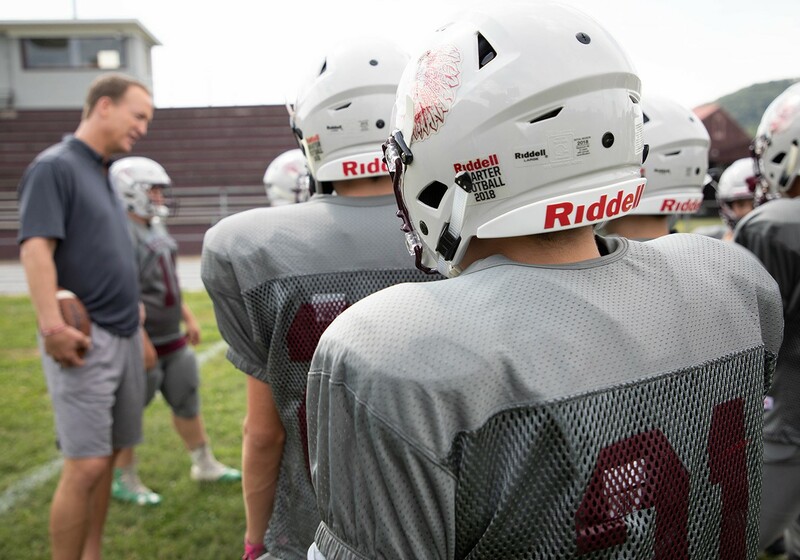 A Riddell rep came to see him and played the meeting off as wanting to get some feedback about six new helmets that Rogersville had previously purchased. Then came the surprise of a lifetime. The rep had a video message from Peyton Manning congratulating Rogersville on winning one of the grants. 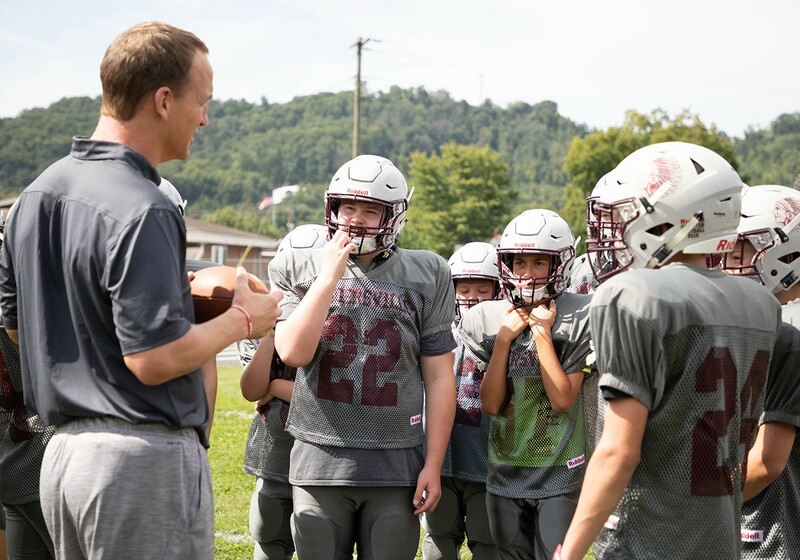 Here is a link to a list of all 18 programs that won grants from Riddell as well as a video that Riddell put together about Rogersville Middle School and a surprise visit from Manning. After the equipment arrived, it was time for Bailey to surprise the kids, but he really wasn’t sure just how much gear the Warriors were receiving from Riddell. So he told the kids that Rogersville was selected to appear in a video. When they got to the locker room, the new equipment for the Rogersville Middle School Warriors was waiting there for them. But there would be another surprise. After Riddell reps had arrived for the unveiling, Bailey was walking, and a special guest was whisked in to walk right behind him. The surprise visitor was none other than Peyton Manning! After Bailey surprised the players with the new equipment, it was time for the kids to meet a two-time Super Bowl Champion. And in walked Manning to a thunderous reception from the kids. The grant has meant the world to Rogersville Middle School and the entire community. The kids were so excited to receive the new equipment and it’s inspired them on and off the field. They love to show off the equipment and take it home. The grant has also inspired about 15-20 students who currently do not play football to ask when tryouts for next year’s team take place. At the end of the day, it just goes to show that it pays off to practice “Smarter Football” and Heads Up Football. Congratulations to Rogersville Middle School and the other 17 winners. There’s no doubt that schools and other football programs around the country are getting their applications ready for next year’s grants!